Oberon String Quartet - Wedding Music, Corporate Events, Parties - London, Hertforshire, South East. The Oberon String Quartet was formed in 1990 and has established itself as one of the most successful quartets in London and the South of England. Drawing from a team of highly experienced and professional musicians the quartet is able to provide music for two separate events on one day. 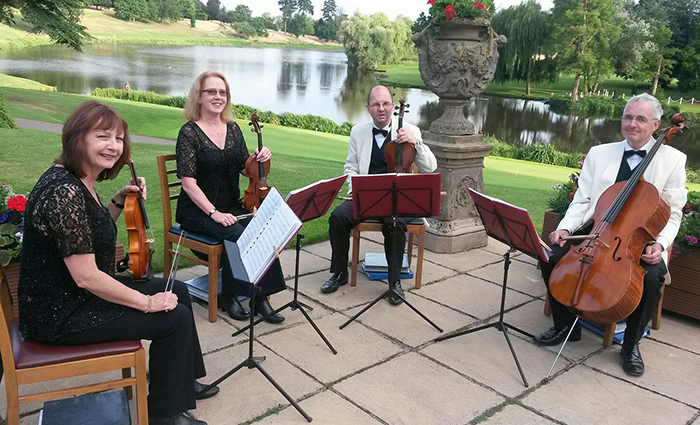 The Oberon String Quartet specialises in playing at weddings: Church, Civil Ceremonies and Civil Partnerships. Please see our 'weddings' page for more details and our 'testimonials' page for a selection of thank you letters from some of our happy clients. The quartet is privileged to have played for many prestigious events including for the 9th/12th Lancers Regiment in Germany before their deployment to Afghanistan, The Duchess of Richmond's Dinner, Northwood Officers' Mess, two farewell events for the Vice-Chancellor of Cambridge University and at the new Home Office building where they performed in front of many distinguished guests including The Home Secretary and The Permanent Secretary. The Oberon String Quartet perform regularly at St. James's Palace and have played in the presence of many members of Royalty including The Queen, The Duke of Edinburgh, The Duke and Duchess of Cambridge and Princess Anne. Events they have played for at St. James's Palace include the WRVS 60th Anniversary, the Royal Navy and Royal Marines Charity, Boodles 250th Anniversary and for Tourism Ireland with Van Morrison. Large and varied selection of music including classical, pop and film. Ranging from Bach, Pachelbel, Strauss and Brahms to Adele, Beatles, Bruno Mars, Coldplay, Elbow and Snow Patrol..
Based in East Finchley, The Oberon String Quartet covers mainly the areas of London, Hertfordshire, Buckinghamshire, Middlesex, Surrey, Berkshire and Bedfordshire. "We recently booked Oberon String Quartet for a conference as some entertainment for the Gala Dinner and drinks reception. All I can say is WOW! They really read the crowd and played a mixture of both contemporary and classical music and everyone loved their contribution. As we sat for dinner, it was just a perfect match for great conversation mixed with excellent music. I would highly recommend them for any occasion. Thank you so much guys!" "The Oberon String Quartet. It's been great working with you - you have been most professional. I hope we can work together again." "We would like to thank you for the wonderful ambience you created in the build up to our ceremony. The playing was beautiful and moving and really added to our big day immensely. We cannot thank you enough for your professionalism and the choice of music fitted the day perfectly, best wishes"
"It was a pleasure meeting you and your colleagues last night. I just wanted to say a big thank you for providing such excellent music during the pre-dinner drinks reception; we received some lovely remarks.....we look forward to seeing the Oberon String Quartet again at St. James's Palace. Kind regards. 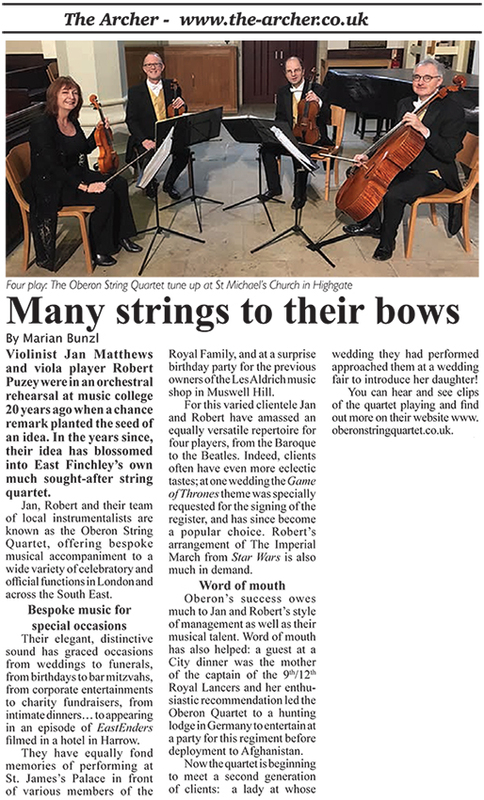 An article about The Oberon String Quartet was recently published in The Archer (East Finchley's Community Newspaper). Read it here.